Please note all JIBC campuses will be closing on Friday, December 21, 2018 at noon and will re-open on Wednesday, January 2, 2019. Happy Holidays! 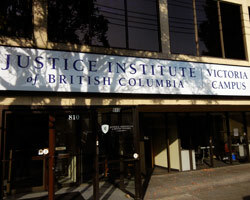 To serve our Vancouver Island learners and clients, the Victoria campus is located in the heart of downtown Victoria. Several facilities at this campus are available for rental. 7:30 a.m. - 4:30 p.m. *See note below. Saturday & Sunday Closed Saturday & Sunday Closed *See note below. *If training hours are required after 4:30 p.m., Monday-Friday, or on Saturday and/or Sunday that must be arranged with the Facilities Administrator or Facilities Administrative Assistant at the Victoria campus at least 5 business days in advance of the first training date. Please call the campus directly to arrange after hours and/or weekend training. There is no parking provided at the Victoria campus. There are two City of Victoria parkades located within two blocks of the campus: one in the 700 block of View and one in the 700 block of Broughton (under the public library). Street parking is available on Fort Street and is free until 9 a.m. However, you may only pay for 90 minutes and then must move your vehicle to another city block; re-metering is not allowed in the City of Victoria. There are several City of Victoria bicycle lock up posts along Fort Street near the front entrance to the campus, but there is no bicycle parking inside the JIBC Victoria Campus. Please note that there are no food services available at this campus, though there are many restaurants within walking distance.